The secular world has begun celebrating Christmas; if you haven’t already notice. In some malls, the tinsels and Christmas trees came up as soon as the Deepavali decorations were taken down and in some places, even before they were stored away. Yes, the store decorations have been up for some time and there are Christmas (as well as “holiday”) parties on our social agendas during the month of December. Perhaps, the only people that seems altogether insulated from this and who zealously work to resist this are the ones found in Church, especially the Parish Priest. In spite of the festive mood, the Church obstinately seems to hold unto a wet blanket sort of a demeanour, one which deliberately tries to dampen our celebrations. Instead of a celebratory atmosphere, there is an air of austerity during this period. Everything seems toned down to the bare minimum. Take for example, the Mass during this season, we immediately note a less festive setting. Fewer floral arrangements, if any, adorn the church. There’s a better than fifty per cent chance you’ll hear some unfamiliar medieval sounding hymn (again, not sung in a particularly festive manner) then a Christmas carol many of us had been eagerly waiting to hear and sing since the beginning of the year. We don’t get to sing the Gloria either during the opening Rites. The liturgical colour for vestments is purple as in the penitential season of Lent (or a funeral). Isn’t Advent a run up to Christmas and shouldn’t it therefore be proximate preparation for this most joyous celebration of the year? Isn’t this sober mood overdone? Changing popular customs, especially in connection with preparation for Christmas, have diminished appreciation of the Advent season. Something of a holiday mood of Christmas appears now to be anticipated in the days of the Advent season. As a result, this season has unfortunately lost in great measure the role of penitential preparation for Christmas that it once had. Advent was originally a penitential season, not a period of pre-Christmas frenzied shopping, frivolous caroling nor drunken partying. No, Advent is about repentance. That is why today, we hear the story of how John the Baptist went into all the region around the Jordan, proclaiming a baptism of repentance for the forgiveness of sins. His ministry resonates with the call of the Prophet Isaiah, “Prepare the Way of the Lord, make straight his paths.” And this is what we are about in Advent. In Advent we are preparing for the coming of Jesus. We are preparing, in the first instance, for the coming of Jesus at Christmas. And we all enjoy making the practical preparation to celebrate the feast; we start to buy and wrap up presents. We plan Christmas dinners and parties and stock up the refrigerator with good food. And all these practical preparations are important because Christmas is an important feast and we want to celebrate it well. But when John the Baptist tells people to “Prepare the way of the Lord” I don’t think he is expecting his listeners to go out shopping for presents! John the Baptist, who lives in the wilderness, is not thinking about decorating houses. John the Baptist, who eats locusts and wild honey, isn’t thinking about stocking up the refrigerator with food. John the Baptist, who wears camel’s hair with a leather belt isn’t thinking about fine clothes. Well what is he thinking about? John the Baptist is thinking of repentance as the essential preparation for the coming of Jesus. What would you do if you knew that Jesus was coming tomorrow? What would be on the top of your to-do-list if you knew the world was going to end this evening? I guess the last thing would be to put up your Christmas tree, right? Heading for the confessional seems pretty important, even desperately urgent. Repentance. Let’s pause for a moment and think about this word, which is so alien to our times, so completely counter cultural. 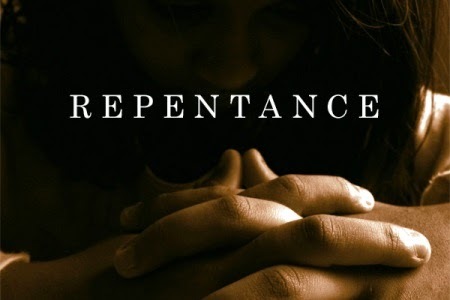 What does the word Repentance mean? Repentance means putting God in the first place in our lives and making sure that everything else finds its rightful places in our lives under God. Repentance means letting go of our own will, in order to follow the things that God wills for us. It means turning away from sin and all rebellion against God, in order to be obedient to God and to follow him in all that he wants from us. Repentance means owning up to our sin, our human frailties, our fears, our inner hurts and entrusting all these to God’s mercy and compassion. In this way we become free of sin, from fears, from hurts and they cease to have power over us. This allows us to walk in the way of God without carrying loads of baggage. Repentance therefore is not a one time thing. It is a process that goes on for a lifetime. Little by little we orientate ourselves ever more perfectly in God’s love for us. Repentance is about returning our gaze to God, changing the direction of our life in order to face, to see and receive our coming salvation. Repentance means knowing our need of God. In turning our lives around, we come to recognise that our self-sufficiency is inadequate and that we need to cooperate with God in our own salvation. But talk of repentance makes modern-day Christians nervous. In fact, the preaching of repentance is one of the main reasons some people stay away from the Church. We hate it when the homilies seem to hammer sin and seemed bent on making us feel guilty. We rush to assert that Jesus isn't really like that, he came out of love to help us rather than judge us. This explains why repentance is such a rarity today. It’s because many have become numbed to the voice of their conscience. So many are lost because they have lost the sense of sin. One of the most popular myths of our age is that if you can claim to be a victim, you're automatically sinless. Today, we would hide behind the disfunctionality of our childhood and society, and choose to blame someone else for our actions, rather than to face up to our own sinfulness. But our penitence is not the penitence of those who have no hope of forgiveness, but of those who have been redeemed by the dying and rising of Jesus the Lord. Thus our penitence is life-giving and not death dealing. Penitence is not the result of a guilt-ridden neurosis but the general consequence of humble admission of responsibility. Repentance is indeed the necessary doorway to the spiritual life, the only way to begin and the only way to grow in spiritual maturity. Anything else is foolishness and self-delusion. Only repentance is brute-honest enough, and joyous enough, to bring us all the way home. So as we continue our journey to Christmas, we need to repent of our comfortableness with sin. Repent of our self-centeredness, which makes Christ and His Church one of the lowest priorities in our lives. Repent of worshiping our idols of popularity, materialism and power – these have become our new religion. Repent of our all-consuming dedication to the shallow, temporary things of this world, and of our casual attitude toward Christ and the demands he makes of us. We need to come out into the wilderness where God reforms and transforms His beloved People – on His terms and not our own. Avail yourself to the very reason Jesus came as a Child to Bethlehem: he come down to be among sinners. Yes, but he came to call us into the Kingdom of Light. So prepare the Way of the Lord!